A motorcycle mounted helmet carrier device includes a pair of linear support members each having first and second ends, each support member with a helmet receiving support plate member at the first end thereof. A linear connecting rod member is secured at each end to one linear support member to maintain the pair of support members in parallel register. The second end of each linear support member attaches to a motorcycle. Each linear support member includes at least one aperture adjacent the helmet receiving support plate at the first end thereof. Each linear support member with aperture therein is adapted for locking a helmet supported upright upon the support plate to the linear support member. The Helmet Handler is designed to be mounted to the back of a motorcycle and support any helmet in an upright position and be lockable to it. It is made of cast aluminum and powdercoated. All mounting hardware is stainless steel. Includes all stock ( approx. 300 units boxed and labeled) ,unfinished brackets and hardware, packaging materials, casting production molds. And, of course, the patent. This is being offered as an outright sale of everything I own in connection to the product. 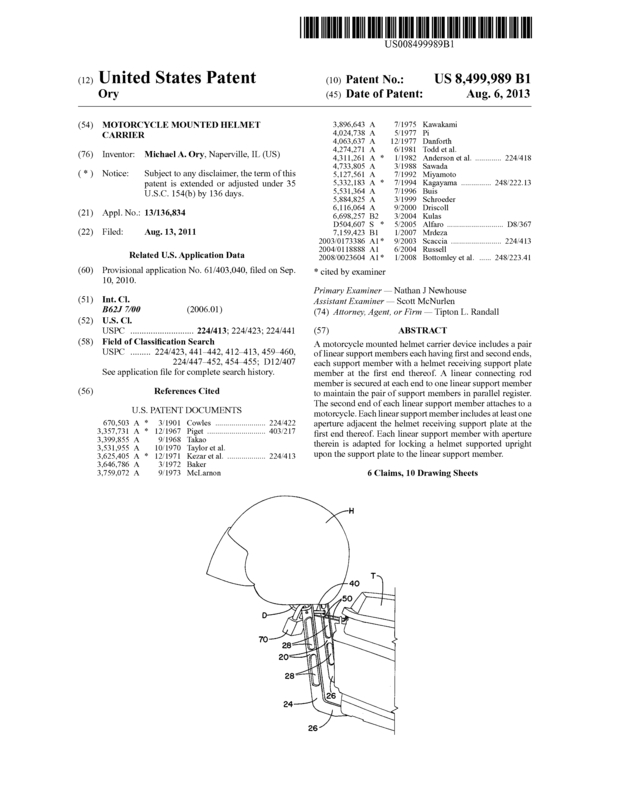 Page created at 2019-04-21 18:16:24, Patent Auction Time.